In warm and sunny Florida, you rely on your air conditioner to keep you comfortable. In fact, in the summer, when temperature and humidity levels soar, air conditioning could very well save your life. If you’ve been experiencing more illness lately, though, you may want to look a little more closely at your air conditioner. Is your air conditioner making you sick? Here are five symptoms you shouldn’t ignore. Have you been experiencing more headaches than usual? Are you especially tired, even after a good night’s sleep? Do you feel ill often, even though your doctor says you’re healthy? If you can answer yes to these questions, it may be your air conditioner making you sick. This phenomenon is referred to as “sick building syndrome”. 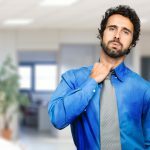 A study published a few years back in the International Journal of Epidemiology found that people who worked in office buildings with central air were sick far more often than those who didn’t. For years now, the Environmental Protection Agency, or EPA, has said that indoor air is almost always more contaminated than outdoor air. Central air conditioning does not cool fresh air; rather, it recirculates air from inside the home. This makes your system far more efficient. For this reason, if there are contaminants in your house – whether these are pollen, dust, or even viruses and bacteria – your air conditioner is likely spreading them around your home. To combat this, use filters that are designed to capture the smallest possible particles. Try to circulate fresh air through your home from time to time to “flush out” potential contaminants. Air conditioners cool by removing humidity from the air. As a result, you likely spend much of your time in a very arid environment. Dry air will pull the moisture from your skin, leaving you flaky and itchy. Fortunately, this is one of the easiest things to fix. Simply install humidifiers in your home, or consider adding a whole-home humidifier that will control the moisture in every room. A 2004 study, again in the International Journal of Epidemiology, found that individuals who spend much of their time in air-conditioned environments have more problems with their health. This leads them to see their doctors more often – namely ears, nose, and throat specialists, or ENTs. This information was derived from studies conducted over a period of two decades. Is your air conditioner making you sick enough to see the doctor more often? It’s certainly possible, so be sure you get plenty of fresh air and change your filters regularly. Perhaps the number one sign that it’s your air conditioner making you sick is new onset or worsening breathing problems. Air conditioners that are not properly maintained can spread particles that irritate the airways. This can cause anyone to experience breathing problems. However, this side effect is even more pronounced in individuals who have asthma, COPD, emphysema, and other similar conditions. Change your filter regularly and be sure to have your air conditioner and ducts cleaned regularly to keep breathing problems at bay. Is your air conditioner making you sick? Per the evidence, it could be – especially if you’re spending much of your time in air-conditioned environments. Remember to get plenty of fresh air, use a humidifier, keep your system clean, and use the right filters to prevent illness. Your body and your wellbeing will thank you.